Derek and the Dominoes, a one album wonder, made that one album for the ages - "Layla and Other Assorted Love Songs". Georgia Cracker Duane Allman, the great Soul Music session player that was the backbone of the Allman Brothers, who still play together today. And to that correct end, Derek and the Dominoes's "Layla and Other Assorted Love Songs" stands along side: the Beatles's iconic "White Album", "Revolver"; Led Zeppelin's "Led Zeppelin IV"; the Beach Boys's "Pet Sounds"; the Rolling Stones's "Beggars' Banquet", "Sticky Fingers"; Pink Floyd's "Dark Side of the Moon"; Simon and Garfunkel's "Bookends"; Bob Dylan's "Blonde on Blonde"; Joni Mitchell's "Blue", the Eagles's "Hotel California", Elton John's "Madman Across the Water", Van Morrison's "Moondance", Bruce Springsteen's "Born to Run", "Greetings from Asbury Park, N.J."; and so many other iconic collections of assorted masterpiece melodies, too numerous to mention here. But, I digress: What is so special about that one album version of Derek and the Dominoes's "Why Does Love Got to be so Sad?" Simply stated, "Why Does Love Got to be so Sad?" will always be among my favorite rock 'n' roll songs, but only one version of it - the version that appears of "Layla and Other Assorted Love Songs". It was the moment in that studio at that one one moment in time, where, these 5 disparate musicians, of Derek and his Dominoes, where they caught the proverbial "Lightning in a Bottle". It was a fabulous moment where two of the great guitar pickers of all time - Eric Clapton and Duane Allman - traded licks in this super fast version of a song full of passion of love, and the love of that passion told through rock'n'roll. I loved it then, and now, 44 years later, I love it now. The original four members of Derek and the Dominoes: (from left to right) Jim Gordon, Carl Radle, Bobby Whitlock, and Eric Clapton. 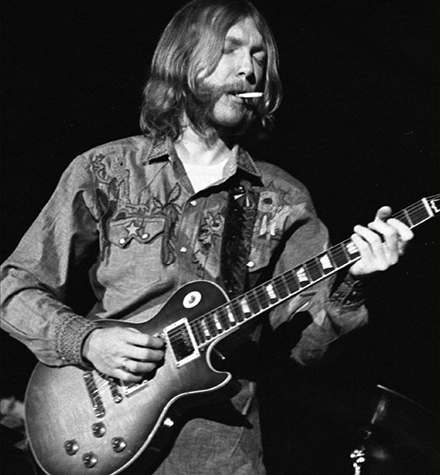 Duane Allman joined later, for a brief time, to add that special ingredient to make that magic sound. Below I offer three versions of this classic song "Why Does Love Got to be so Sad", and will explain this "Lightning in a Bottle" concept, and why I show a video that only offers the studio version, without video of the artists performing, and why I then show this song played many decades later, where an aging Eric Clapton, still quite capable, making his licks as best he knows, with the accompaniment of Derek Trucks (Allman Brothers's drummer, Butch Truck's nephew) handling Duane's consummate licks. The third version is of this classic tune is from the song's co-creator Bobby Whitlock just this year. And now the reason why there is one timeless, irreplaceable, irrepressible version, and then many other outstanding versions of this remarkable song: Duane Allman died from a motorcycle crash just months after this song's release in 1971. Lamentable to the extreme, the Allman Brothers continued and Greg Allman, Duane's Brother, keeps a formidable ensemble, featuring Derek Trucks, in force today. Eric Clapton went on to become one of the greatest musicians of the 20th Century, but still recognizes Duane as: 'my artistic alter-ego'.